Balochi is spoken in Pakistan, Iran, Afghanistan, India, the Arab Gulf States, Turkmenistan and East Africa. It is classified as a member of the Iranian group of the Indo-European language family which includes Kurdish, Persian (Farsi), Pashto, Dari, Tajik, Ossetian. Balochi is closely related to Kurdish and Persian. There are two main dialects: Eastern and Western. It is difficult to estimate the total number of Balochi speakers, but there are probably around six million, most of whom speak Western Balochi, which is also the dialect that has been most widely used in Balochi literature. Within the Western dialect are two further dialects, Rakhshani (in the northern areas) and Makrani (in the south). The areas where Eastern Balochi dialects are spoken (the north-eastern areas of Pakistani Balochistan, Punjab and Sindh) are in many ways less cdeveloped, espeically when it comes to education, than other parts of Balochistan, which accounts for why it is little used in the written form. Balochi was used only as an oral language until the post-colonial period. Before that it was generally regarded as a dialect of Persian and there was no tradition of using it in writing. 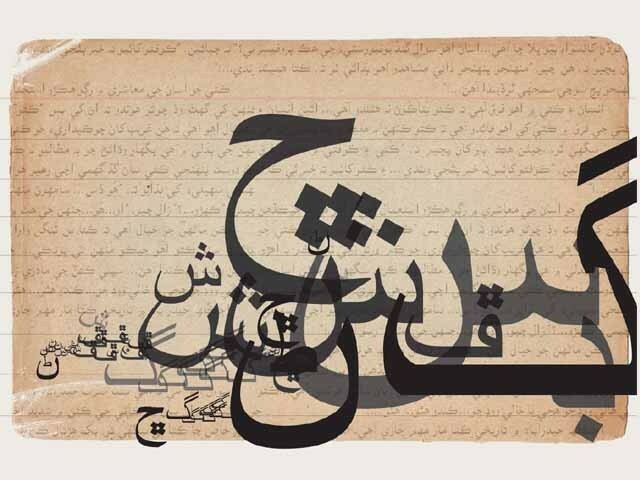 Although some works in Balochi had appeared before then, the Balochi literary movement got fully under way only after the creation of Pakistan in 1947. The Constitution of Pakistan (1973), states that "any section of citizens having a disticnt language, script or culture shall have the rifht to preserve and promote the same and, subject to law, establish institutions for that purpose", and "a Provincial Assembly may by law prescribe measures for the teaching, promotion and use of a provincial language in addition to the national language". In 1989, Prime Minister Benazir Bhutto gave permission for the use of local languages (Balochi, Pushto, Brahui) in primary education in Balochistan, however there have been several problems associated with this program of mother-tongue education, namely: other language groups also seeking to have their language taught; the lack of teachers who are capable of implementing the program; and the fact that many parents want their children to learn Urdu and English, not a language that will be of little use outside of the immediate community. There is a Balochi Studies section at the Balochistan University in Quetta which teaches and researches the Balochi language and literature. In addition there is a Balochi Academy, also located in Quetta, which both publishes literary works in Balochi and supports the work of literary organisations. The Academy receives limited government funding. There are several Balochi language publications in Pakistan, the two most prominent being Balochi (published in the provincial capital, Quetta) and Labzank (published in Karachi). "Go and visit all the schoosl in Lyari [an area of Karachi inhabited by many Baloch] and give a language test to the children. You will find that they cannot speak good Urdu or good English. It is due to their mother tongue. If you get education in your mother tongue, you can understand everyhthing. If you don't, you cannot understand anything." (Titus, 1996)"
According to the Constitution of the Islamic Republic of Iran (1980), "the official language and script of Iran, the lingua franca of its people, is Persian... The use of regional and national languages in the press and mass media, however, as well as for teaching in schools the literatures written in them, is permitted in addition to Persian". The reality, however, is quite different. At present there are no publications in the Balochi language. A number of magazines emerged after the Islamic revolution in 1979, but were closed down soon after, due to pressure from the authorities. There is no provision to teach Balochi literature in the schools of Iranian Balochistan. Radio Zahedan broadcasts a daily Balochi language program from the capital of Sistan-va-Balochistan province, Zahedan. Many Baloch in Iran are concerned about the strong Persian influence on Balochi, as all education takes place in Persian/Farsi. What is the adjective of "Baloch" in English? Our country is called Balochistan, that point is clear. We live in Balochistan. We speak Balochi, we have several Balochi dialects, we weave Balochi carpets, we ride Balochi camels, we (hopefully!) give Balochi names to our children. We read Balochi poetry which is published at the Balochi Academy. And what about the noun? Am I a Baloch or Balochi? Are my parents Baloch, Balochs, Balochis or Baloches? Baloch: Baloch is generally known as a noun. The native people who live in Balochistan are called Baloch. Generally Baloch people speak Balochi, but even if native people can't speak Balochi, they are still called Baloch. They can migrate and live in other parts of the world. They can still refer to themselves as Baloch. So, I believe that it is now accepted that "Baloch" is noun in this context. Mistakenly, some non-Baloch scholars use the word "Balochi", instead of "Baloch" when referring to people of Balochistan. For instance, they may say: "Baaraan is Balochi". It is wrong. "Baaraan is a Baloch" is the right expression. One my say that "Baaraan is a Balochi name", which is a correct phrase to say. So, I am a Baloch, not Balochi (likewise, Hazhaar is a Kurd. Hazhaar is a Kurdish name. But saying "Hazhaar is a Kurdish" is a rather an inaccurate expression). On many occasion, it is rather use a "the" before Baloch, when we refer to people of Balochistan (in national adjective usage). For instance, national adjectives ending in "ch" or "sh" e.g. the Dutch, the Spanish, the Welsh (see The Oxford Library of English Usage, Chapter I, 1990. Similarly we can say "the Baloch" etc. Javier is a Spaniard. He speaks Spanish. He eats Spanish food. He is a Spanish person. (But although one may say that "He is a Spanish", the more accurate way is to say it is "Javier is a Spaniard", instead of "Javier is a Spanish. The same applies for Scot (native Scottish person from Scotland) etc. Please remember that there is not a universal rule about this issue. e.g. " Shah Latif was a Sindi (Sindhi). He spoke Sindi (Sindhi) and he was from Sind (Sindh). As you see in this case the word "Sindi" is used both as the noun for naming people from Sind and the language. As for Plural version of the word "Baloch", there is no universal accepted form. Some people use "Balochs", other use "Baloches". Increasing number of people use "Baloch" as both singular and plural. In my view, using "Baloch" as both singular and plural is somehow a better way to use it. A parallel in English language is the word "Dutch" (people and language of Holland). When referring to people from Holland, they are called "Dutch", whether one or many people. I have never seen expressions such as "Dutchs" or "Dutches". I think it looks nicer in a sentence to use "Baloch" as both singular and plural form. One can understand from the sentence, whether we talk about one person or many. It is a personal preference, but words "Balochs" or "Baloches" do not appeal to me. I rather use "Baloch" only. (Some people may write it as "Baluch", "Balouch" etc. Again "Baluchs/Baluches" or "Balouchs/Balouches" do not sound "attractive". Balochi: Anything related to the Baloch (people from Balochistan) can be described as Balochi. It can have genitive form or simply used as an adjective. Languge of the Baloch is called Balochi. Not only, we the Baloch, call it "Balochi", but every other non-Baloch person also called it "Balochi". At least, there is unanimous acceptance about this issue. There are still variations in spelling "Balochi" such as "Baluchi" and "Balouchi". But it is not a big deal. "Balochi" is mainly used as an adjective e.g. "Balochi dress", "Balochi book", "Balochi dance", etc. "Baloch" cannot be used in the same context. It is, however, to be noticed when one refers directly to people, i.e. the Baloch, it is rather use "Baloch" not "Balochi" in any compound nouns. e.g. Baloch Students' Federation (not Balochi Students' Federation) as it refers to Baloch people (in this case, students). Also "Baloch women" but NOT Balochi women (again Baloch refers to people, women) etc. In the meantime, there is a need for a flexible approach towards this issue, as there is no standard/universal rule especially with regards to "Baloch", "Balochi" etc. The same applies to Balochi orthography (both in Persian/Urdu and Latin/English alphabets). At this stage, there is no excuse for exclusion of any approach, style and preferences. As for various dialects of Balochi language, there is an even greater need for flexibility. Broadcasts in Baluchi were introduced on 25th December, 1949 by Radio Pakistan with a 45 minute daily programme on a 10 kilowatt short wave transmitter from its Karachi station, which was also established soon after Pakistan gained its independence in 1947. The programme consisted mainly of a news bulletin, talks, features and folk music. It served as a great boon to the Baluchi language and the development of its literature and music. The Baluchi broadcasts helped generate great interest and enthusiasm amongst the poorly educated but spirited Baluch population of Karachi. They started up new literary societies and held regular meetings and sessions. The broadcasts also prompted the publication of the first regular monthly Baluchi magazine Oman, edited by Maulana Khair Mohammad Nadvi. It was first published in Karachi in 1951. The programme proved a great challenge and a novel experience for the broadcasters responsible for the translation of the news bulletins from English. They were obliged to come up with a workable script that could be easily read by them at broadcast time. A group of students from the Karachi colleges formed the pioneer talent recruited to translate and read the news and plan the other programme contents. Another problem was finding musicians and folk singers. Fortunately, these were available among the Baluchi speaking population of Karachi, mainly immigrants from Iranian Baluchistan, the coastal areas and other parts of the former Kalat state. The quest for musicians, both vocalists and instrumentalists, led to a large number of hitherto unknown artists being discovered and launched. These people, who had never seen a radio station before and had no knowledge of what was expected of them, were auditioned by a committee and booked to perform "live" in the days that followed. These were artists who could sing classical lyrics, verses from folk tales, war ballads and other epic poetry, which had been learnt from the classics and handed down from generation to generation. A large number of singers of ghazals and compositions of modern day poets were also included in the programmes. Both the broadcast material and the recording facilities were inadequate in those days. Since tape recording had not been introduced, Radio Pakistan had its own disc-cutting machines set up in the studios, where recordings were made for the purpose of building up a library. As time passed, it also became possible to introduce variety into the programme contents. A vast treasure of folklore in the form of romantic ballads were broadcast as musical items, features and plays. In the field of the spoken word a variety of new formats such as musical features, full length radio plays, short stories and stories for children were regularly broadcast, in addition to talks on cultural and literary topics, tales from Islamic history, skits on topics of interest to women, eg child care and miscellaneous pastimes, were regular items. The broadcasts in Baluchi from Radio Pakistan in Karachi were suspended when another radio station began broadcasting from Quetta on 17th October 1956.